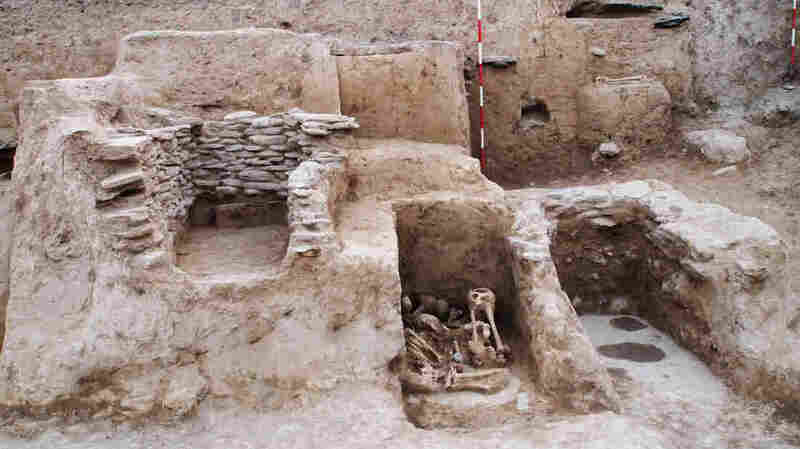 In Pakistan, Secrets Of A 3,000-Year-Old Cemetery A team of archaeologists is excavating an ancient cemetery in the Swat Valley. The site reveals the ancient Dardic community's burial and post-burial rituals, including using graves for more than one generation. A cemetery uncovered in Pakistan's Swat Valley is thought to be from around 2,500 to 3,000 years ago. High on a hill overlooking Pakistan's scenic Swat Valley sits a recently excavated cemetery. Italian archaeologist Luca Maria Olivieri walks across the site and lays a sun-beaten hand on a clay slab jutting out from a high, dun-colored wall. It's an ancient grave. Olivieri says the remains still have to be carbon-tested, but archaeologists believe the graves contain members of a Dardic community, which dominated this part of Pakistan 3,000 years ago. It's believed Alexander the Great fought one of his battles here, in the village of Udegram. The grave site was discovered when a landowner started to develop the area. Olivieri is one of several archaeologists working with the local Archaeology Community Tourism Project. He says his group made a deal with the landlord to stop building for one year so they could excavate the cemetery. The graves were apparently opened and reopened multiple times, serving more than one generation. 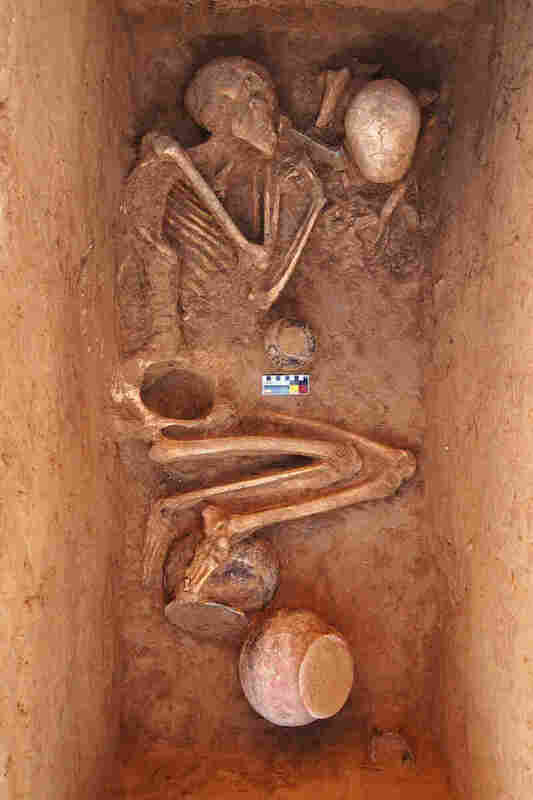 The archaeologists discovered a collection of 32 sealed graves. Olivieri says the site reveals the community's burial and post-burial rituals. "So these graves were opened, reopened, reburied and filled and emptied and refilled several times because [they belonged] to families who were using it for more than one generation," he says. In one small corner of one grave, Olivieri shifts two small stones and gets a glimpse of some remains. It's a femur. He says most of the graves contained two skeletons: male and female, facing each other. The archaeologists discovered hairpins and spindles, beautifully preserved pots, ornaments made of copper and bronze, and some pieces of iron. Olivieri says carbon-testing may prove the fragments are the oldest traces of iron on the subcontinent. What they didn't find in any of the graves was a weapon. Olivieri says the contents seem to be carefully chosen to show the ancient community's values. "If we consider this ... cultural assemblage as a positive proof of what this culture wanted to show, even to themselves, this was the most important thing for them," he says. Olivieri says Swat Valley is a paradise for archaeologists and anyone interested in ancient culture. He's been coming to this area for some 25 years, mostly to work on the excavation of Barikot, an ancient city nearby. Olivieri says Barikot is a much more important archaeological site, but it's the Udegram cemetery that has captured attention lately here in Pakistan. In a country plagued by insurgent attacks, electricity and gas shortages, and a plummeting economy, the Udegram grave site has become a good news story. "It's like something amazing for us to have major excavations all around, especially in ancient sites that belong to the time of Alexander the Great," says Niaz Ali Shah, the curator of a provincial museum. "A great experience, in fact, for the younger archaeologists of our province." Olivieri says the biggest concern is finding enough time, expertise and financing to excavate all of the Swat Valley's buried treasures.